Calcium must be balanced with magnesium and adequate levels of magnesium are essential for the absorption and metabolism of calcium. • Magnesium stimulates a particular hormone, calcitonin, that helps to preserve bone structure and draws calcium out of the blood and soft tissues back into the bones, preventing some forms of arthritis and kidney stones. • Magnesium suppresses another bone hormone called parathyroid, preventing it from breaking down bone. • Magnesium converts vitamin D into its active form so that it can help calcium absorption. • Magnesium is required to activate an enzyme that is necessary to form new bone. • Magnesium regulates active calcium transport. With all these roles for magnesium to play, it is no wonder that even a mild magnesium deficiency can be a risk factor for osteoporosis. Further, if there is too much calcium in the body, especially from calcium supplementation, magnesium absorption can be greatly impaired, resulting in worsening osteoporosis and the likelihood of kidney stones, arthritis, and heart disease. Excess calcium can also deposit in cancerous tumors worsening this condition. 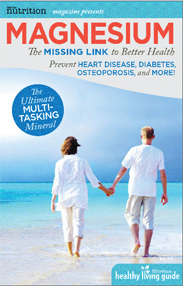 It is unfortunate that the treatment for osteoporosis has been simplified into the single battle cry “Take calcium”. Calcium dominates every discussion about osteoporosis, is used to fortify dozens of foods (including orange juice and cereal), and is a top-selling supplement, but it cannot stand alone. The balancing mineral for calcium is magnesium, in a ratio of at least 1:1. For people who have magnesium deficiency, a healthier ratio is two parts magnesium to one part calcium. The most common form is magnesium citrate in powder form. When taken in divided doses throughout the day, it does not cause a laxative effect. Magnesium is a “safer” product than calcium because it is excreted more completely and doesn’t build up in the body. 1. Brown S, Better Bones, Better Body, Keats Publishing, New Canaan, CT, 1996. 2. Brown S, Better Bones, Better Body, Keats Publishing, New Canaan, CT, 1996.